Last week’s Programmatic I/O was another successful conference put on by AdExchanger. There was a big focus on in-housing, video, TV, GDPR, AI, and of course, Sir Martin Sorrell. However, there was also the usual talk about bots, fraud, direct supply, and ads.txt-- sigh. One of the presentations that I sat in on was by Oliver Maltez, Head of International Communications and Media Planning at Volkswagen AG. He shared a shocking fact about ad fraud. It is estimated that advertisers globally will lose about $20 billion to ad fraud in 2018 and an even more outrageous $45 billion in 2022. Correct me if I'm wrong, but I'm fairly certain ad fraud is not the area where we want to see hockey stick growth. That’s not just crazy, it’s head-banging-against-wall crazy. Agencies and brands obviously want to eliminate fraud, but what else do they want? Kevin Mannion from Advertiser Perceptions shared some insights about what agencies and brands are looking for in DSP partners. It came down to two key points: what do they want and what specific problems are they trying to solve. 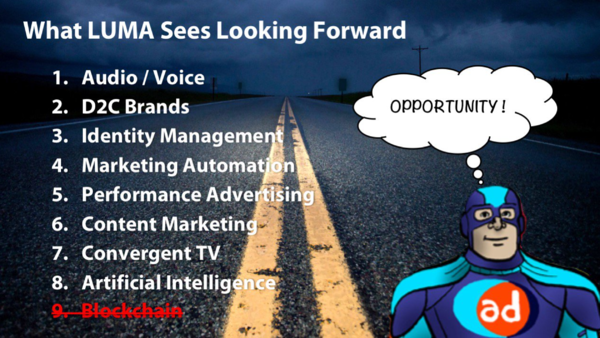 They’re looking for a proven track record, advanced audience targeting capabilities, ability to reach a large audience, and multi-channel/platform buying. They need to be able to easily target the right audience, expand their reach, improve overall campaign efficiencies, and report on/leverage insightful data. Aside from these needs, they also want to avoid some of the ad tech nightmares like brand safety issues, poor inventory and pricing, and lack of transparency. Digital programmatic is working on addressing these issues, but audio is already there. Considering programmatic radio/audio is the most brand safe and free of ad fraud, I was surprised that there was only one audio-centric presentation. Brett Robinson, Senior Director of Ad Operations at NPR, delivered a great presentation about achieving scale and efficiency with podcasting. After Terence Kawaja shared LUMA's "What LUMA Sees Looking Forward" list and audio/voice made the number one spot, I was expecting more coverage about key audio-related topics. However, I imagine that audio and automation will be a big topic at the next conference. Overall Programmatic I/O was a great conference. It’s no secret that ad fraud is a problem that the digital sector needs to address, but until then, advertisers should feel confident that there are DSP partners beyond digital/video that can guarantee a positive ad tech experience. Did you attend Programmatic I/O? Feel free to connect with me on Twitter if you want to chat about any of these takeaways.